Staples and Darien are no strangers to close games. In 2014 the Wave eliminated Staples from the state tournament, 2-0. 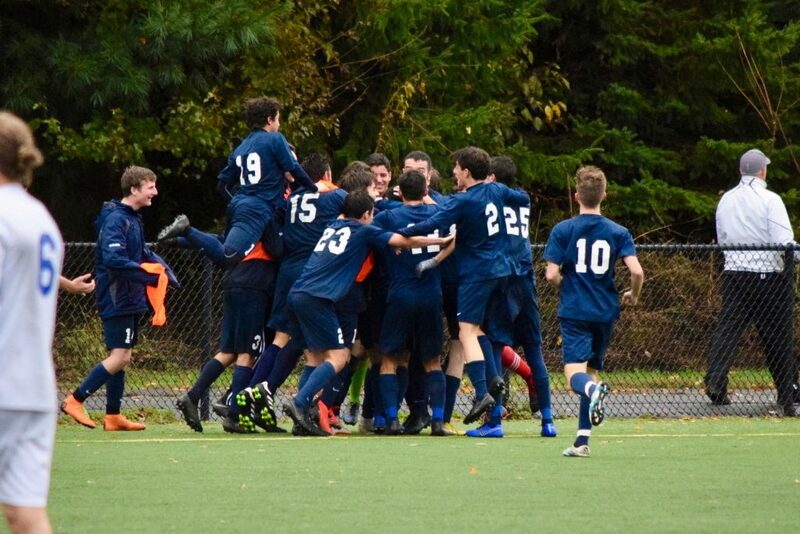 The next year Darien knocked the Wreckers out of the FCIAC playoffs, by the same score. Regular season matches have been tight too. The Westporters won one game on Patrick Beusse’s goal with 13 seconds to play. The Wave countered with a late stunner at Staples. Last month, the teams tied 0-0. It was the Wreckers’ 60th anniversary celebration. Rain all morning during the girls game made Loeffler Field muddy. The coaches decided not to move to the Wakeman turf at Bedford Middle School. Staying at The Hill was applauded by the 150 alumni, who saw a great, gritty match. There was no question that today’s game would be played at Wakeman, though. Constant rain all fall has made Loeffler Field bumpy. Staples plays ball control, possession-style soccer, with plenty of quick passing and the ball on the ground (or carpet). The Wreckers are good on grass — and better on turf. In 60 years, today was the first time Staples played a home state tournament match away from The Hill. Predicted thunderstorms never materialized. But a constant morning rain made even Wakeman slippery. Staples adapted well — technically. Tactically, they did not spread the ball as wide as they wanted in the first half. Neither team had dangerous chances, though the hosts had a slight territorial edge after Darien’s initial edge. The Wreckers made adjustments at halftime. But Darien stunned them 2 minutes after play resumed. A slot from the corner was redirected nicely by Charlie Sears, into the far left corner. Still, 38 minutes remained. Staples did not panic. Instead, they played with controlled urgency. Patricio Perez Elorza initiated attacks out of the back, on the right. He combined with Vaughan Sealey and Sam Liles, working the corners. Wilson Daniels came on to provide speed up top. The left was Matthew Tanzer’s domain. In the 50th minute Nick DiMasi drew the keeper out, for Staples’ best chance thus far. Three straight corner kicks came up short, though. Lefty Penderakis held the ball well up top. Austin Sholes and Gabe Baltierra were ball winners in the center of the field. 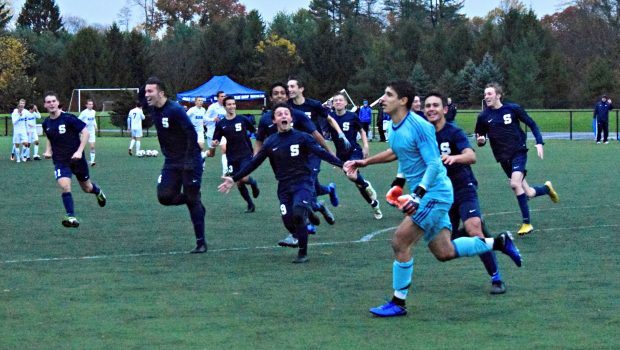 Behind them, Rob Diorio, Nick Ambrose and Surya Balaji kept Darien at bay for long stretches. Keeper Ry Cohen came up big the few times the Wave slipped through. Staples’ pressure paid off in the 62nd minute. Balaji won a header, and found Perez Elorza. The junior laid off to Sealey, who launched a searing pass to speed demon Mauricio Inglada. The keeper came out, Inglada kept his poise, and finished first-time with the outside of his foot into an open net. Staples’ celebration was wild, and well-deserved. The Wreckers continued to press. The match grew physical, but the officials let the players play. For the 2nd match in a row, Staples headed to 2 10-minute overtimes — to be played to completion. 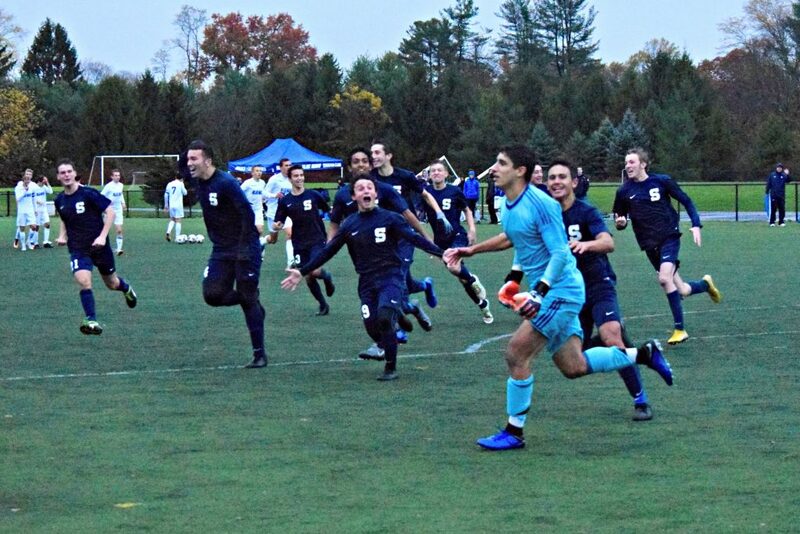 Eight days ago, they were scoreless with Trumbull in the FCIAC semifinal. Darien had the run of play for the first 5 minutes, but the home side held firm. Tenaciously, Staples again gained control. They had several close-in chances — mostly off of clever work on the sides — but the Wave defense was tight too. For the 2nd match in a row, Staples headed to penalty kicks. Eight days ago, they made just one against the Eagles (who converted 3). 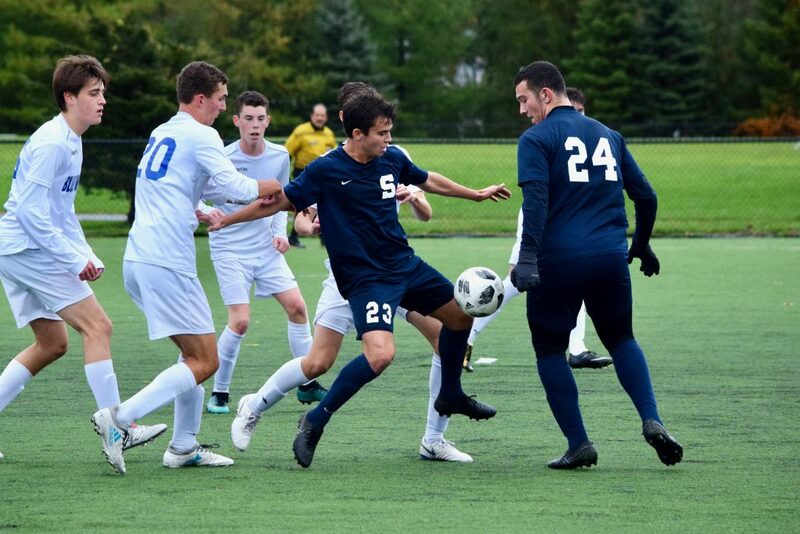 A shot at the FCIAC championship slipped away. The Wreckers knew they had not struck their shots confidently or well. This time, they vowed, would be different. Shooting first was sophomore Balaji. His PK was true. So were the next 3 shooters: seniors Sholes, DiMasi and Penderakis. But Darien matched them, shot for shot. Each team had one man left. The Wave needed to match it, forcing another 5 shots from 5 new kickers. Instead, the shot sailed high. The Wreckers piled on each other in the middle of the wet turf. Their soggy fans joined them. It was almost dark, but who cared? With grit, passion, adaptability, flexibility — and plenty of flair — they headed to the 2nd round. They’ll face #7 Cheshire — winner by 2-1 in overtime over #26 E.O. Smith — on Thursday, away. The forecast is for sun. 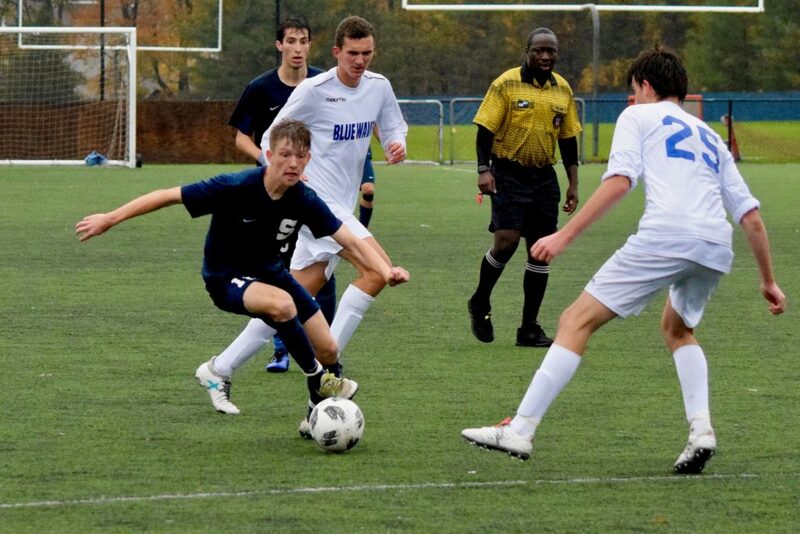 FINAL SCORE: Staples 2, Darien 1 (Penalty kicks, 5-4). SEASON RECORD: 12-3-4.